The NASA Jet Propulsion Lab uses neodymium magnets in each of the Mars Exploration Rovers. The magnets are used to collect space dust for examination during the mission. Read more about it here:	Mars Exploration Rover Mission - Magnets. Joe Magneato in space! 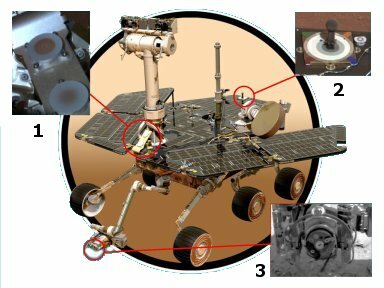 In the picture at right, three sets of magnets are shown on a picture of the Spirit/Opportunity type of rover. One set of two magnets is mounted on the front of the rover at an angle so that non-magnetic particles will tend to fall off. These magnets are reachable for analysis by various instruments. A second magnet is mounted on the top of the rover deck in view of the Pancam, next to the color calibration / sundial. This magnet is strong enough to deflect the paths of wind-carried, magnetic dust. A third set of magnets is carried by the Rock Abrasion Tool (RAT). As the RAT grinds into martian rocks, scientists have the opportunity to study the properties of dust from these outer rock surfaces. The earlier Pathfinder and later Curiousity rovers use similar magnet arrays for similar reasons. We have many customers that are professional printers that use our magnets as nifty closures for brochures, binders, boxes, and other presentation pieces. Usually a pair of magnets is used, but this can also be accomplished using one magnet and a matching steel piece. Two magnets have an attracting force that is about 1.5 times greater than the force between one magnet and a metal piece. Many different magnets can be used for this application, depending on the size of the piece and holding force desired. Be sure to check out our article about Adhesive Backed Magnets, which discusses a folder closure in detail. Recommended magnets: D401, D41, D501, D51, D601, D61, D701, D71, D801, D81, B4401, B441, B6301, B631, B661, B821, B841, B8801, B881. If you need to hold two or more pieces of metal in place, a few of our cube or block magnets can be invaluable, whether it be for welding, drilling or machining. Our magnets are often used in oil pans, on oil filters or elsewhere to filter metal chips out of oil. Be aware that standard neodymium magnets will lose strength if heated over 178°F. If your application involves higher temperatures, see our D66SH (Super High Temp) cylinders or D82SH discs. Our super-powerful magnets are great for finding hidden nails in walls - exactly what stud finders do. Small spheres like our S4 work well to locate nails under tile, linoleum, hardwood and most other types of flooring. While we can't say that magnetic therapy works or not, millions of people swear by it. Choose the size depending on the body. Oh, the amazing things you can do with strong magnets. Alnico horseshoe and bar magnets can become demagnetized if dropped, stored without a keeper, or by repelling other magnets. Instead of throwing them out, you can remagnetize them using neodymium magnets. Stroke the north pole of a strong neodymium magnet from the center of the alnico magnet to the south pole end of the horseshoe several times. Then, stroke the south pole of the neodymium magnet from the center of the alnico magnet to the north end of the horseshoe several times. This will recharge the worn out alnico magnet. If you reverse the directions, you'll re-magnetize the horseshoe in the opposite orientation! Check out our D4X0-ND to help identify the poles of your neodymium magnet. Serious fishermen often modify their fishing reels to control the reel's spool in order to prevent a line overrun during casting, avoiding the tangled mess of line that sometimes happens on long casts. A Google search will turn up lots of sites that provide instructions for doing this. An example of practical science - Eddy currents at work. Magnets can be used to secure a cache in place, as a treasure in a cache, or even to retrieve hard-to-get cache. We have had many customers successfully use our magnets to hold banners and signs on cars and floats for a parade. Easy on and easy off. Our Mounting Magnets are often used to hold small GPS units on vehicles or equipment that need to be tracked. A few of them mounted on the unit will hold the unit in place and allow for easy removal. We've all seen the spice cans you can buy that stick to a fridge. Why buy 'em when you can easily make your own? There are some commercially available rods sold that allow for easily locating the position of a trailer hitch and the tow ball. A magnet on the end of each rod allows easy attachment on the hitch and the ball, so the driver can see the exact position of each. They make hooking up a trailer much quicker and easier. Our Mounting Magnets work great for this. Got a dent in your tuba? Fix it with a magnet. This is done by inserting a steel ball into the instrument of similar diameter to the thickness of where the dent is located. A large magnet is then used to control the ball and work it to the dent. Once in place, the ball can be rolled back and forth over the inside of the dent until the dent is worked out. Our MM-E Mounting Magnet Hooks are an excellent option for hanging signs from steel warehouse ceilings or beams, making them easy to install and rearrange as necessary. They are also excellent for holding signs and labels to steel shelving. Once thought impossible, permanent magnet levitation is now possible thanks to neodymium magnets and strongly diamagnetic materials. See our Levitators Page for more info. Our D42 discs are a favorite of Berenguer Baby enthusiasts. The magnets will also work well with other dolls, teddy bears and stuffed animals. Whether you are holding large or small tools or knives, we have a magnet for your application. You can build your own fancy holder using steel or stainless steel, or simply hang a magnet and hang a tool from it. If you need to hold a tarp on something metal, our magnets are perfect. From covering cars, trucks, backhoes, motors, lawnmowers...you name it, neodymium magnets make great tarp holders. If you have a bunch of tapes that need degaussing but don't have an electromagnetic degausser handy (who does? ), a few swipes from a large neo magnet will do the trick. Our many sizes of magnets are suitable to hold most any size tool. Get all of those yard and hand tools off the floor and up on the wall where you won't trip over them. Looking for metal or that elusive property pin? Put a large neodymium magnet on a stick or pole and you should be able to find it quickly. Using magnets to attach the wings on model aircraft allows the wings to release in a crash. This reduces breakage and maintenance time. If you have old and weak magnetic cabinet latches, sticking a strong neodymium magnet on the back or side of the old latch will usually bring it back to life. We have also seen craftsmen embed our powerful magnets into their furniture to create invisible magnetic latches. If you don't want to put a pin through your nice clothing to wear a name tag, a couple of medium sized neodymium disc magnets will do the trick. Simply place one on the inside of your clothing and one on the name tag. We also have a few specialized name badges with adhesive tape attached. Many of our customers use our small discs and blocks to make parts of their miniatures interchangeable. Games like: Warhammer Fantasy, Wahammer 40K, Warmachine, Flames of War just to name a few, all easily lend themselves to removable and/or configurable parts. Things like tanks turrets, weapons, model bases, equipment, banner poles, display boards, storage etc. all become much more versatile and fun to play with when part can be easily removed and/or interchanged. For more information, visit this site: Miniature Wargaming - Free Wargames Resources. Some of the faster slot cars use traction magnets to help stick the car to the track for faster lap times. You can use neodymium magnets, in place of, or in addition to the stock magnets, to make the car stick to the track even better and decrease lap times. We have some custom traction magnets for the Tyco 440-X2 cars that will be available soon. Custom neo traction magnets for other cars will also be available in the future. Tired of weak magnetic couplers on those old model railroad cars coming loose? Strengthen the coupler by using neodymium magnets instead. No more model crashes. Many people use our magnets to hang Christmas decorations on their steel front door, or pretty much anywhere you can stick a magnet. Even if you have aluminum rain gutters, you can use magnets to hang lights and decorations. Simply put one magnet on the inside of the gutter and one on the outside. Those decorations aren't going anywhere! Also see our Mounting Magnets and Hooks for more magnetic hanging options. Scientists use magnetic stirrers so they don't have to dip a stirring stick into a mixture and risk contamination. One magnet goes in the solution to be stirred, and one moves around the outside to agitate the submerged magnet. Each of our neo magnets is strong enough to react to the earth's magnetic field. If they are suspended or allowed to freely spin, they will always line up to magnetic north/south. Magnets are an essential part of any generator. The stronger the magnets, the more efficient the generator. From preschool though graduate school, magnets make for wonderfully entertaining and educational experiments. Everyone can learn from, and be entertained by the incredible power of neodymium magnets. The earth is bombarded by millions of tiny meteorites every day. A strong magnet can help you find the ones that fall near you. Be sure to check out our article about Magnetic Meteorites! Magnetism effects our everyday lives in more ways than most people think about. Magnets make great teachers aids for demonstrations. They can be used with our nickel plated steel balls to visualize molecules, geometric shapes, architectural and engineering principles, and many other mathematical and scientific principles. Our smaller magnets (large ones will pinch and hurt) are often used in pierce-free body jewelry. One strong magnet inside of a rag or sponge placed on the inside of the tank can be guided around with another strong magnet from the outside. No more getting your shirt sleeves wet! Our strong magnets are often used to hang a key or key ring somewhere concealed under a car or outside of a house or apartment. Many people believe that powerful rare earth magnets can soften their water and remove contaminants. The fancy magnetic water conditioners that you buy are simply two or three medium or large neodymium magnets in a holder that wraps around a water pipe. You can save a ton of money by building your own using our neodymium magnets. Check out our article about Magnetic Water Treatment. The results we found in our own experimentation might surprise you! Very similar to the water conditioning magnets. Many people believe that strong magnets placed on a fuel line leading to the engine will increase gas mileage and reduce emissions. Two neodymium magnets placed on opposite sides of a fuel line will do the same thing as the expensive "fuel extenders" being sold elsewhere. Pretty self-explanatory. Neodymium magnets can help reduce clutter and hang even large objects from your fridge. One of "Harry-the-Hat's" favorite props. Our larger magnets are often used to secure custom bags to motorcycles -usually on the gas tank. A few powerful magnets will hold a bag at even highway speeds. More than one customer has used our magnets to make removable and replaceable Star Trek Transponders for use in a production. Smaller discs and rings are often used to close bracelets and necklaces. Perfect for people that can't quite do those tiny clasps and snaps. We have custom made rings that are specifically designed for this application. You can see them here: R414CL. Magnets are often used to pick up nails and other metal debris from construction sites, roads and driveways. Most bicycle odometers/speedometers/onboard computers use a strong magnet to trip a magnetic switch sensor to count revolutions per minute, from which computer calculates speed and distance. Our 1/2" x 1/4" discs (D84 or D84B) can be used as replacements for lost magnets or one can be placed on each bicycle that the computer is used on, to eliminate moving a single magnet from bike to bike. This is a new one to us, but apparently, some people swear that exposing wine or liquor to strong magnetic fields accelerates the aging process. We have even seen commercial units being sold that contained our neodymium magnets. We have not experimented with this yet, but you may want to. Please drink responsibly. The "Holy Grail" of the science world. Many people have tried it, nobody has yet succeeded (that we know of). Is there free energy in magnets? It would sure seem like it to most people, but until someone invents the perpetual motion machine, the laws of thermodynamics say "no".